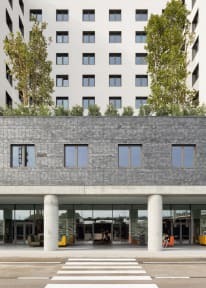 a&o Venice Mestre is the first a&o Hotel in Italy! It offers modern rooms with flat-screen TV, comfortable beds and free Wi-Fi. 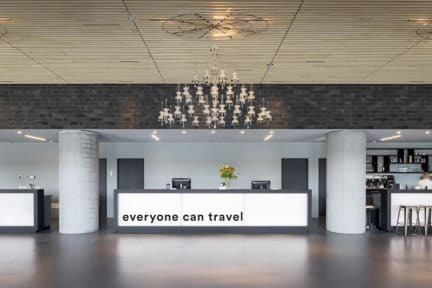 The hotel includes a stylish bar and a spacious lobby decorated with high-quality furniture and light décor as well as projectors showing news, hotel services or daily bar specials. The hotel offers single and double rooms as well as 4- and 6-bedded hostel rooms with private bathrooms with shower, 2in1 shower gel, face tissues and a hair-dryer. Free high-speed Wi-Fi internet is included in all rooms and throughout the property. The a&o Venice Mestre offers buffet breakfast each morning as well as packed lunch service, Snacks, pizza, sandwiches and drinks can be bought at the bar or can be enjoyed on-site. Guests can hire bikes and explore the wonderful city of Venice. Venice Mestre Station is 7 minutes’ walk from the hotel. You just have to take the Viale Stazione and go straight ahead. Then take the street on the left side Via Cà Marcello until a&o Hotel Venice Mestre. Nearby the hotel you can find e.g. Interspar, Osterias/Snackbars. If you want to visit the island, just take the train from Mestre to Stazione di Venezia Santa Lucia. It takes only 10 minutes. Great place to stay! Conveniently located by bus and train station! My first hostel stay after walking around Venice all day and getting lost in the process! But was assisted by great locals who drove me to the location! Grazie! This was the best hostel I have ever seen. Friendly staff, clean room, separate bathroom. I really recommend this hostel to anyone! I can honestly say with great confidence that this is the best hostel I have EVER stayed at. The hostel has brand new furniture and other amenities in all rooms and in the lobby. They provide shower gel/shampoo and in my 8 bedroom dorm we had two bathrooms that each had a shower which was amazing to me. Never been to a hostel with a flat screen TV? Let this be the first as they provide that as well. There is a bus station up the road and a few food places I would estimate as a 5 minute walk. This was my first time my father has stayed in a hostel and im so glad it was here. we both loved our stay. Only issue we had was that thr lift broke down ome evening which scared us a little luckily we were only on the 1st floor. everything was perfect. Very nice and clean rooms! Reminded me more of a hotel than other hostels I have stayed in. Although it is not located on the actual island of Venice, it was an easy 15 min or so bus ride (the bus stop is right behind the hostel). The staff were very nice and helpful, but the front desk was a little understaffed during busy times. It took a long time to ask a question at reception or get a drink from the bar since one person was often staffing both. Nice clean hostel! looks super modern and the 2 bathrooms in the room was nice! kitchen was lacking amenities and only having 1 person work the check-in desk and bar at the same time seemed to be a bit of a disaster. This hostel was clean and we got our own private room which was really nice! The room and bathroom were very clean. The location okay, not much around it but relatively close to buses that we took to the city. Also, they only have one person working the front desk at a time so there was always a long line and some of the employees were really nice while others were rather rude! Everything was great except the employees that were only a few. We had to wait a long time to be attended. It feels like someone with expirence in hotels tried to make a hostel with no idea how to operate one. The common area is giant and completely soulless and does not cater to the kind of socialization or openness that makes hostels great. Despite all of the area, there’s not a kitchen to prepare your own food. They checked us in without telling us to buy linens. The staff was unfriendly, bureaucratic, and got angry over petty things, the balding Indian man was particularly condescending.